This photo of the Batey house shows the home that David built for his bride, Georgiana, sometime in the early 1890s. Photo courtesy of Batey granddaughter Millé Swisher, daughter of Robert Bruce Batey and Camille Walker Batey. Six years before Mortimer Cook arrived on the north shore of the Skagit and founded the town of Bug — soon-to-be Sedro, four British bachelors settled here when there was nothing but a seasonal Indian campground and a dense forest of cedar and fir as far as the eye could see. They shared the strength and perseverance that was common to all the settlers who sunk down roots to keep from being blown over by the November northeasterlies. We know a lot about David Batey but less about the others, in order of our file size: Joseph Hart, William Dunlop and especially William Woods, who enticed Cook to build his general store on Woods's original homestead. Englishman David Batey had a very Dickensian childhood as he was effectively an orphan who suffered abuse and apprenticed as a carpenter. He worked in that trade until he moved to Syracuse, New York in 1872 with his childhood friend, William H. Dunlop. They moved together across the country, first to Omaha and then to San Francisco in 1877. Three years younger than Batey, Joseph Hart was the son of a railroader. He originally trained as a machinist after leaving home at 14, but later apprenticed for three years at a sawmill at Yorkshire. He also moved to America about the same time as Batey and William Dunlop in 1872-73, clearing customs at Philadelphia. He knew Batey and Dunlop in England, but we are not sure if they emigrated together. He moved across the country separate from them, living in Iowa for 18 months, and wound up in San Francisco in 1874, where he worked as a saw filer in a large factory. In the spring of 1876, Hart moved to the White River district, south of Seattle and near the town of Stuck Junction (now Auburn), staying there for almost two years. Several neighbors told him glowing accounts of the rich Skagit Valley. When Hart moved back to San Francisco in 1878, he shared those recommendations with Batey and they decided to board a steamboat together that was bound from San Francisco to Seattle that spring. At Seattle they boarded another steamboat, the Libby, for LaConner, apparently sometime in May. On board the Libby, they met passenger George Taylor, a Baptist minister, who was carrying a letter of introduction to the Reverend B.N.L. Davis, who lived in Riverside, which was then a small logging community north of Mount Vernon proper. Batey and Hart bought an old salt chuck (sea) canoe in LaConner and the three men paddled down the sound to the north fork of the Skagit River. From there they poled upstream to the two log jams that almost completely blocked passage in the river near the bridge that crosses near Mount Vernon. By that time, settlers had hacked a narrow channel through the jams but the current was so swift that the newcomers were forced to portage their belongings on a blazed trail around the obstructions. They then returned to skid their canoe around the same route. Indians made good money for their skills at portaging. The entire process took as long as three days, depending on the weather. Rev. Davis owned a hop farm and cattle ranch on the hill above the south shore of the Skagit near the spot where the Great Northern railroad bridge was later built. This remarkable man was the most famous minister in early Skagit County. He crossed the river delta nearly every weekend with a lantern and a walking stick to preach in settlements of any size. After a short visit with him, Batey and Hart poled upriver past Ball's Camp, after Davis advised them how to navigate and avoid the nasty snags in the fast flowing current. Davis observed many hearty adventurers as they headed upriver in the five years since his arrival, but only a handful of them had stayed. A.R. Williamson planted hop fields near future Lyman in about 1872, followed by Otto Klement the next year, but Klement came back downriver and settled initially just upriver from Davis's ranch at future-Sterling. Past Lyman, Birdsey Minkler, Karl (Charles) von Pressentin, August Kemmerich and John Grandy were clearing land on both sides of the river at future Birdsview. Batey and Hart may have passed two other settlers during that year of 1878 — William Hamilton, who would be the namesake of an upriver town, and George Savage, who brought his large family from Nebraska to Birdsview. The Englishmen passed Jesse B. Ball's new logging camp at the site of future Sterling and about a mile east they camped at a natural landing located just west of future Sedro. Like the others before them, however, they were bound for the upper river, so the next day they rowed and poled ten miles up the winding river to a point where the town of Hamilton now stands. After exploring the area around Lyman and Hamilton, they concluded that the valley was too narrow at that point for a settlement and the river current was too swift and unpredictable for them to transport logs by water. They wanted to settle where a railroad might build a roadbed and the narrow belt of land north of the river did not have much space for such. The south shore was also hemmed in my mountains, and even though they suspected that railroads would come in the future, but they didn't want to wait. So they paddled back downriver to the landing on the north shore where they originally camped. That spot appeared much more inviting because the valley broadened here and the narrow ford looked like a natural place for a railroad trestle to cross the Skagit. Their camping place was apparently on what we now call Hart's Island, actually a horseshoe-shaped sandbar peninsula where the river looped northwards and where Indians camped for centuries. In those early months they were alone and many times that year they were destitute. The outside world was still reeling from the 1873 financial panic, but they were living on their own Walden Pond, independent from urban centers. The only sounds they heard were those of nature — the crashing, bubbling river, chattering birds, wind blowing through the leaves, and the screams of wild animals, including bears, cougars and mountain lions. Skiyou pioneer Eliza Van Fleet later wrote that the men learned to subsist like the Skagit Indians who camped on the island. Indians taught them how to fish for salmon and steelhead. The bachelor settlers relished the Indians' bullhead (fish) stews and they learned to make sauces from the salmon berries, wild crabapples and currants they found growing near the riverbank. Indians also taught them to cut out the acorn gland in a bear's knees that spoiled the taste of meat. Initially they did not even have nails for building a cabin. They chopped cedar trees and split lumber to build a shack out of poles, rough boards and blankets. Eliza recalled them telling her that when the wind blew they had to run out and stand on both sides of their lean-to and hold the pieces together by hand until the wind subsided. One day they left their shack on a hunting trip and came back to find it burned to the ground along with most of their provisions. During the following weeks, Hart became exhausted and malnourished. Batey took their only gun (the stock was burned off in the fire) and he used dried peas for shot to bag a duck and some pheasants for their meager larder. They decided to row to the primitive Ball's Camp (later Sterling) store for provisions, but found only crackers on hand. 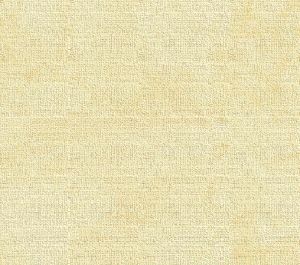 Next they rowed a half day down to Clothier and English's trading post in Mount Vernon, but there were no staples there either. Their only choice was to walk down from the logjam to Skagit City at the fork of the Skagit, where they boarded a steamboat to Seattle. They purchased a large supply of provisions and arranged to ship the goods later aboard a sternwheeler, the Gem, which was being outfitted for service on the Skagit. They returned home by the same route with enough goods to get by and sweated out the next two months until the Gem made its inaugural trip upriver to Ball's Camp. When the Gem did arrive, a deckhand told them how the steamboat barely made it though the log jams. The channels through the jams had been widened, but the current of water was still dangerously swift. To counter it, a crew member had to jump onto the jam, catch a rope thrown from the steamboat and fasten it to an upended log. A deckhand then wound up a windlass that pulled the boat on upstream. A freshet (flash flood) of March 17, 1879, washed out the remainder of the jams so boats could navigate freely from then onwards. Until Batey built his home, most houses in the area were very small log cabins or tumbledown shacks meant for bachelors who lived in them during the logging season. Some were even one-room affairs dug out of cedar stumps. Pioneers burned down many cedar trees instead of logging them, but the gnarly stumps resisted fire. Single men and even some families burned the interior wood of the stump, the same way that the Indians burned out a half log to make a canoe, and then scraped out the charred remains to form a room up to 18 feet in diameter. 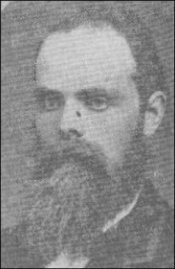 William Dunlop the third to arrive William Dunlop apprenticed as a carpenter at age 15, emigrated to the US with Batey, and moved across the country with him. During his five years in San Francisco, he traveled to Portland twice and then followed his friends, Batey and Hart, to the Skagit two months after they settled here, arriving on the Gem sternwheeler sometime in the late summer of 1878. Within weeks, the three companions completed the formality of homesteading their claims. Batey's claim was near the later Goodyear-Nelson mill, north of what we now call Hart's Slough, the channel around Hart's island that Indians had used as a thoroughfare for centuries. Batey also homesteaded an adjoining 160-acre parcel to the west under his wife's name sometime after she arrived in 1880. Hart's claim of 160 acres bordered Batey to the south and east, and it lay east of the crook of the river and slough. He built his home at the foot of what would later become Third street, just west of the landing for the first bridge that would later be built across the river to Clear Lake. Dunlop's spread extended from the river north to Alexander street and from Third street east to Township road, which was the boundary line of both section 24 and Township 34 north. Left: William Woods at the turn of the century. We know very few details of his life up until he was an officer for the Sedro townsite company. We hope that a reader will have documents or articles about him to share. Below: The Harts on their wedding day. Both photos courtesy of old issues of the Sedro-Woolley Courier Times. William Woods completes the quartet The oldest of the four bachelors, William Woods, preceded the others to the U.S. by at least ten years. His father died when Woods was eight, but he shouldered the responsibilities of the family farm in Tyrone county, Ireland, until he was 19, in addition to completing high school and maybe some college. He was noted here for being well read and educated. When his mother emigrated to Syracuse, New York, in the 1860s, Woods stayed behind and emigrated over to England where he worked as a furnace man for a chemical manufacturer. After four years he was determined to follow his mother to the New World. He joined her in about 1858 and then moved to Quebec where he farmed and worked in a mill for two years. After returning to Syracuse, he worked for a dozen years for a salt company. He may have met the other three bachelors there sometime after they immigrated from England in 1872-73. In 1875 he moved to California, where he worked both as a miner and logger. A confirmed bachelor, he ranged back and forth as the spirit moved him, operating a hoisting works for a while and then mining in southern California. During that time he heard about the opportunities in Washington territory and he moved in early 1878 to Hood's Canal to work at a logging camp. Somehow he heard about the other bachelors moving to the Skagit river and he decided to join them. When he joined the others on the Skagit that fall he claimed 147 acres under the preemption act, mainly east of present Township Street and Dunlop's claim. The claims of Woods and Dunlop eventually proved to be the most valuable of the four during the railroad boom days. Parts of those claims were eventually sold, first to Cook and then to the Fairhaven Land Co. (FLC), to form the initial two plats of the town of old-Sedro during the railroad boom 11 years after the group first arrived. We know that Woods sold at least ten acres to FLC for $8,000, half paid for at the time of the sale. Sometime after 1893 he bought the land back at a forced tax sale. In the unique spirit of those pioneer days, he then split the parcel in half with the owner who lost it and gave him the mortgage on it. Woods was a Democrat and served as Sedro-Woolley's second mayor. He raised beef cattle on 100 acres of his original homestead and had a large strawberry field. William Woods's life is largely a mystery after 1906, when his biography was printed in the Illustrated History of Skagit & Snohomish counties. He was Catholic by faith, and was still a bachelor in 1906. We know very little of Woods' life after the turn of the century, other than that he owned a fine farm east of Township road and west of Hansen creek. We hope a reader can supplement this information about Woods or any of the other bachelors. Update 2011: We finally found the story of Woods's later life, with the help of the state librarian. When he became ill, he literally turned his life over to the Catholic Church in Sedro-Woolley. When the new St. Mary's church opened in 1910, Woods was a prime benefactor, and when he became too ill to live alone, he moved into the church rectory, which he shared until his death. See his 1924 obituary for more details. We have found no record of any marriage for him. The first wives When David Batey returned here after a trip to San Francisco in 1880, he brought Georgiana Ferron with him as his new bride. Georgiana was 12 years older and a widow (the story of her life and remarkable career will be added later). Until Dr. Mattice and other physicians arrived in the railroad days nine years later, she was the only university-trained doctor in the area. She received her degree in Iowa and practiced in San Francisco, where her first husband, Thomas Ferron, was a butcher. They lost a son when he was killed in a hack or horse-drawn taxi accident. 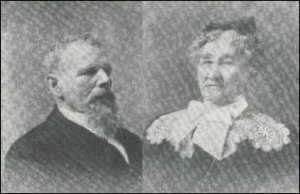 We have learned from their granddaughter, Millé Swisher, a family story that David and Georgiana met around the time that Batey and Hart were departing California for Washington territory. 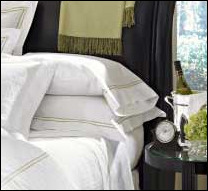 The story goes that Georgiana and her husband were preparing for a sea voyage but that he never arrived at the wharf. Apparently Mr. Ferron was shanghaied aboard a ship bound for the Orient and Georgiana never saw him again. We have searched in vain for information about the wedding of David and Georgiana, but there is no record from Whatcom county in that year, so they must have married in California. Many of those records were destroyed in the aftermath of the 1906 San Francisco earthquake. Batey built a combination house and hospital for her in the early 1890s. It was large enough to board businessmen and planners when Sedro was still just a rough town site in that decade. 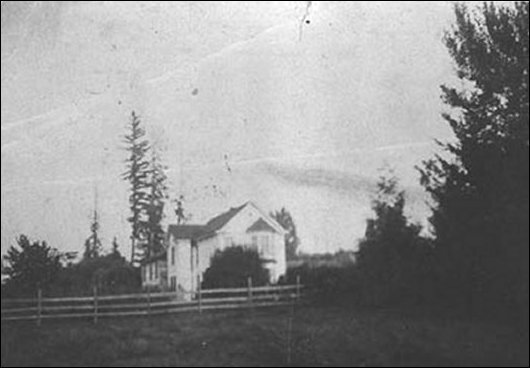 The house stood just south of the elbow turn on the present Rhodes Road until it burned in a fire in 1923. The barn that Batey built just a few months before that was saved and it still stands on the Ray Houser farm. Until Batey built his house, most homes in the area were small log cabins or tumble-down shacks. Some were even one-room affairs dug out of cedar stumps. Pioneers burned down many cedar trees instead of logging them, but the gnarly stumps resisted fire. Single men and even some families burned the interior wood of the stump and then scraped out the charred remains to form a room up the 18 feet in diameter. Many people ask why both the mill and a slough include the name spelled as Beatty on some maps and early publications. We must admit that we have no answer. The slough itself flowed from Cook's wharf at old Sedro to Hart's island and followed the north edge of the ancestral river bed and has a bench rising above it. At one time the slough was dammed up to form a mill pond but it is now a mere shadow of its former self and is often nearly dry during summer months. Joseph Hart married Emma Louisa Anderson, a native of Sweden, on Dec. 27, 1887. We know that she moved to Sedro in 1886 to join her brother, the cook for Cook's shingle mill, because Mortimer Cook's daughter Nina recorded her arrival in her diary. The newlyweds moved south to Seattle sometime in the '80s, but they returned often to visit the Bateys. In January 1891, Hart moved back to Sedro and teamed up again with David Batey to help run the Sedro Saw and Planing Mill, which was located between their claims, near where the Goodyear-Nelson mill was later built. The mill was launched to supply ties for the SLS&E rail line and it thrived as a shingle mill until the financial panic of 1893, but burned to the ground in 1896. The Harts had two children. Emma, born in 1890, managed the home farm from 1926 until her death in 1954. She remained unmarried and was the most famous woman farmer in the district. Dolly, always known as Dora, was born in 1896 and married Walter Young; they lived in Clear Lake. After Emma's death the farm passed to Dora's daughter Rose, who married Frank Janicki. Janicki's daughter from a prior marriage now owns the farm. Hart was a charter member of the Skagit County Pioneers Association and both he and his wife were members of the Order of Pendo. 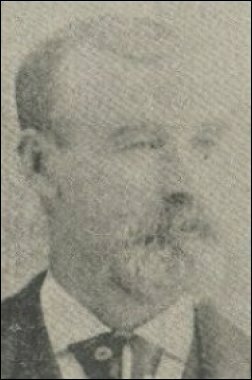 Though he was an avowed socialist in the early days, Hart left much valuable property when he died in 1933, including land here and city property in Everett, plus livestock. In 1926 he built Hart apartments in Everett and lived in one until a few months before his death. He died in the Clear Lake home of his daughter Dora and her husband. We have found correspondence of Nina Cook that indicates Hart may have contributed to the Equality Colony near Bow at the turn of the century, but the correspondents may have confused Joseph with colony activist Charles Hart, who was not related. Louisa died in 1948. 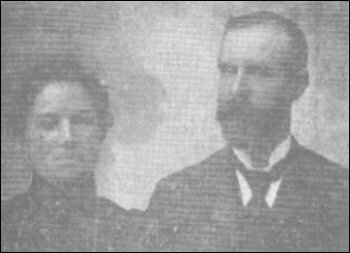 The Batey Family In 1896, around the time of the mill fire, Batey was stricken with sciatic rheumatism. The combined misfortunes forced him to sell off all but 65 acres of the 320-acre homestead. The remaining acreage stretched from his home north of the river east to where the Goodyear Nelson mill later stood. When he recovered in 1898, he opened an apple vinegar works near the mill site and was known for that business until he died in 1930. Their daughter Susannah, always known as Susie or Susan, was born on Sept. 20, 1881, the first white child born upriver from Sterling. After Batey sold his original farm in the early 1920s he built a small home on what later became the GN property. Susie lived there after the death of her parents. 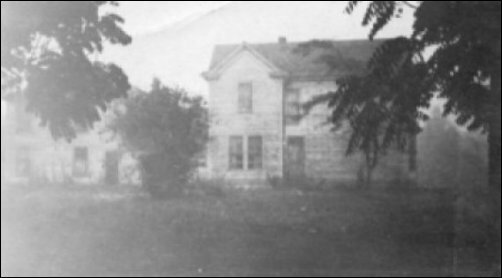 That home was moved to a spot on Rhodes road just west of Rothenbuhler Engineering and still stands there today. Son John Henry was the bridge tender for a long time on the Northern Pacific railroad bridge that crossed the Skagit. In the early days, it was a swing bridge that opened for boats with tall masts. 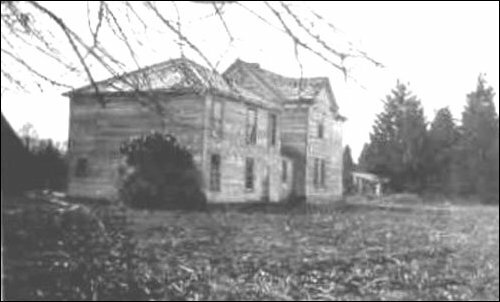 His wife, Minnie Lederle Batey, taught in Sedro-Woolley schools for more than 20 years and was one of the charter members of the Territorial Daughters of Washington. John Henry later became the Equitable Life Insurance representative here and the late Howard Miller took over the business from him when he retired. When Robert Bruce Batey worked at his father's mill, he lost four fingers of one hand in a saw accident and his mother saved his hand from being amputated. Batey's great granddaughter, Millé Swisher, recalls that when David was in his 70's he saved her mother from drowning in the river after she jumped in to save her favorite pet dog, which had fallen into the swift current. That is just one more testimony to the toughness of those early pioneers. Dr. Georgiana Batey died in 1927, three years before her husband. Below: As you can see, Dunlop was a handsome young man and probably cut a fine figure when socializing. But he remained a bachelor and it is a shame that he was the least quoted or noted of the four bachelors. We hope that someone will find or share more information about him. Both photos courtesy of old issues of the Sedro-Woolley Courier Times. 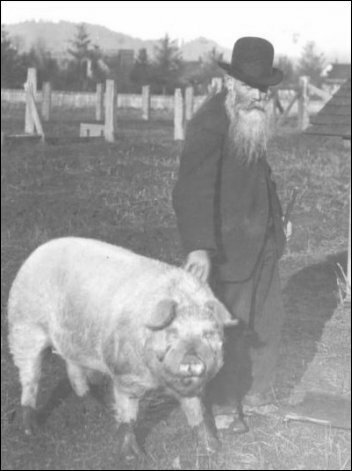 Above: a photo of Dunlop at age 81 with his prize pig during the 4th of July celebration in Sedro-Woolley in 1939. Dunlop's early days William Dunlop remained a bachelor all his life. He was a staunch Republican, but apparently did not seek office. He might have been at least mildly amused when the easterners from the Fairhaven Land Company misspelled his name as Dunlap on a street in Lower Sedro. Or maybe that was a spelling for his native clan. There is no record that explains it. His name was misspelled as late as 1949 but some time over the years the spelling was corrected. That is now the southernmost street in the town proper. He apparently maintained his trade of carpentry and raised pigs as we can see in the 1939 photo above. We recently discovered two newspaper clippings in the Territorial Daughters records that illuminated Dunlop's life somewhat. From a June 16, 1949, Courier-Times clipping we learned that his nephew, Ian Morrison, moved to Sedro-Woolley briefly after World War II. He lived with Mr. and Mrs. Walter Young. Rose Young was Hart's youngest daughter and she and her husband lived on the original Hart farm along with her sister Emma. 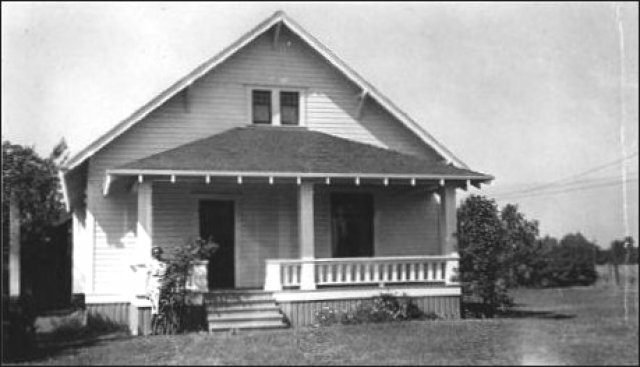 The story explained that Morrison visited his uncle's original house, which was then still standing at the foot of 6th street at Alexander. In searching the original plat records he learned that his uncle's plat ended on the east between 6th and 7th streets. In Dunlop's Courier-Times obituary, dated July 28, 1921, we read that when he died his grand-niece, Miss Annie Thompson, was on the way from England to keep house and care for him . She could not be stopped in time and, after she arrived, she wound up staying here and lived with the Allen Ringer family. The obituary goes on to say that poor health forced Dunlop to move alone to a small house across from White & Ropes Livery at Murdock and Ferry after selling his property two years before his death. Click on any of these thumbnails for photos of the Batey houses. See the extensive list of all Sedro-Woolley-related stories in our Check out Sedro-Woolley First section. Timeline of Sedro and Woolley through the merger in 1898. Sources for this story include: An Illustrated History of Skagit and Snohomish Counties (Their People, Their Commerce and Their Resources with an Outline of the Early History of the State of Washington — Endorsed as Authentic by local committees of pioneers), published by Interstate Publishing Company, 1906, partially written and edited by Harry Averill; Ray's Writin's, Yarns of the Skagit county by Ray Jordan; various copies of the Sedro-Woolley Courier-Times and the Mount Vernon (now Skagit Valley) Herald; correspondence with descendants; and exhaustive research of material in the Skagit County Historical Museum of LaConner and the Allen Wing of the Suzallo Library in Seattle.